Creating 3D Drawings in Pool Studio for swimming pools and backyards is a fun process! Collecting ideas and input from our customers is a large contributor to these gorgeous designs. Designing these renderings truly brings the backyard design to life. Utilizing these 3D Drawings streamlines communication and provides a great visual for our customers. Oftentimes our customers love sharing these videos with their friends and family. It always boosts everyone’s excitement for this exciting project. 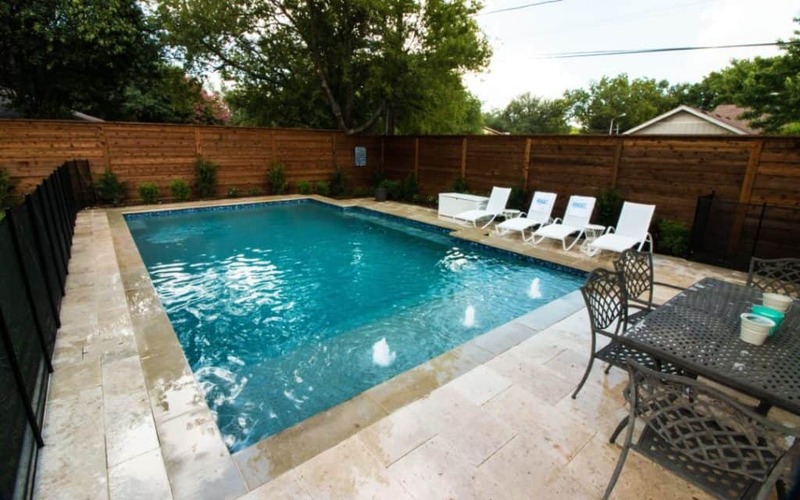 At Summerhill Pools, our top priority is building a beautiful backyard space that fits your lifestyle. We invite you to contact us for a free estimate today! Many homes in Dallas, TX have smaller backyards. This often leads homeowners to believe they cannot ever purchase a swimming pool. This is not the case. The Maple Ridge Drive is a perfect example of creating a beautiful outdoor space with the limited square footage. This is a rectangular pool design that utilizes the sophistication of 3’x3′ Porcelain Pavers. We laid these pavers in a French style layout. These pavers are amazing and do not require sealing. They will not fade or weather from the sun or other outside factors. It is easy to install these pavers on gravel, sand or grass (such as this pool). An 18″ raised glass tile wall. These water features are controlled by an automated system and can be operated from any smartphone using the Screen Logic Bundle app. We really support the use of automation with your swimming pool. As always, we are also more than happy to answer any questions regarding this technology. Please feel free to reach out to us if you would like some more information on adding automation to your existing pool!